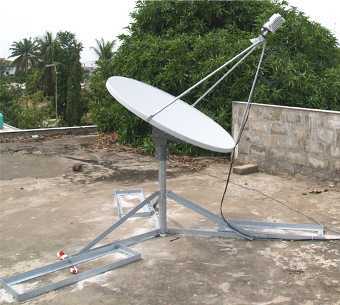 Andrew 123 VSAT dish installation. Fig 1. The picture above shows a Ku band cross polar feed. The finned unit on the right is the 14 GHz transmit BUC and the upper units on the left are the transmit reject filter (TRF) and the LNB. The broad faces of the LNB and TRF waveguide are on either side and therefore the receive polarisation is Horizontal with an approx 15 deg anticlockwise adjustment, as viewed while looking towards the satellite. Note the auto-vulcanising tape used around the waveguide joints to protect against humidity entering. This installation is in Cotonou, Benin, Africa. Fig 2. This non penetrating mount frame may be used either with concrete blocks fitted into the rectangular frames, or alternatively, as here, may be attached to the concrete base with six expanding screw bolts. On the roof top. Instead of using ballast plates the NPM was fixed with screws and bolts on the concrete roof surface. To balance the relatively strong inclination of the roof the prepared holes on the diagonal arms of the mount could not be used. We had to drill new ones in order to get the vertical tube exactly vertical. Cotonou, Benin. Fig 3. This image show a similar feed to that above in Fig 1. In this case the feed is rotated further left anticlockwise, perhaps -50 deg polarisation adjustment. 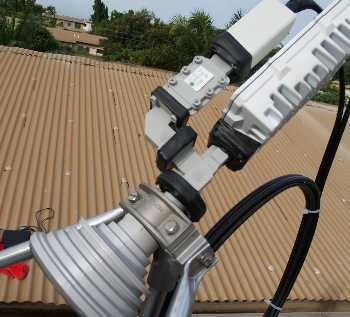 The starting position for horizontal polarisation would have been with the LNB on the top, directly above the transmit BUC. This installation is in Accra/Ghana. Fig4. As viewed towards the satellite. The minus 50 deg anticlockwise rotation adjustment of the Horizontal polarisation is clearly seen. The red line, showing the orientation of the LNB, has been tilted 50 deg anticlockwise. 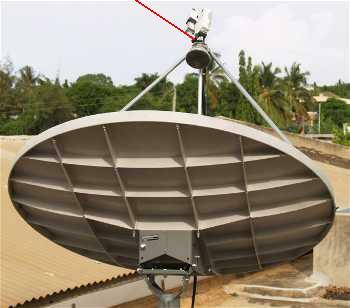 The Andrew 123 dish is a 1.2m diameter antenna with a relatively long focal length (the distance from the feed to the lower edge of the reflector) compared with the dish diameter. This improves the cross-polar isolation performance and reduces interference both to and from other services on the same satellite. 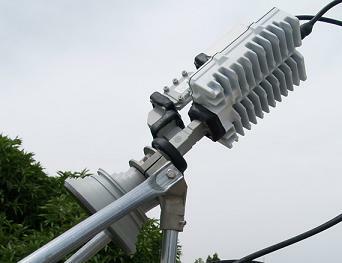 The dish has a performance of better than 30 dB cross-pol isolation within the -1 dB transmit beam width. This is good. The antenna offset angle is 16.97 deg, which means that if the front surface of the reflector rim is oriented vertically then the beam elevation angle is 16.97 deg.